Dr. Groh (third from left) and the ME SOLshare team. Dr. Groh wins the award for the project The Energiewende 3.0 - Smart P2P Solar Grids. In short, A SOLshare grid is created when rural households or SMEs agree on setting up a “swarm network” that consists of existing and new solar home systems (SHSs) and storage devices and enables the interconnection of larger loads. ME SOLshare provides a peer-to-peer solar energy trading platform empowering individuals and SMEs to become solar entrepreneurs offering pay-as-you-go and cash-in-as-you-go electricity solutions to low-income households. ME SOLshare therefore has potential to play a crucial role in supporting rural development and providing a means of direct income to rural communities. 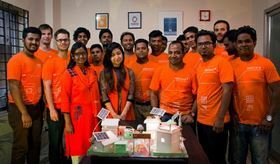 Elsevier and the International Solar Energy Society (ISES), launched the Renewable Transformation Challenge to encourage progress to a world powered by renewable energy and accessible energy for all. Dr. Groh, on behalf of ME SOLshare, will receive a monetary prize of €20,000, one ISES Gold membership, and one free registration to the Solar World Congress 2017 in Abu Dhabi where he will be presented with the Award during the conference dinner on 1 November 2017. There is a €20,000 prize for the first place entry. The winner, or one representative of the winning team, will receive a free registration to the Solar World Congress 2017 in Abu Dhabi, where the presentation of the Award will take place, and one Gold membership to the Society. The winning project will be featured on the Solar Energy journal homepage and on the ISES website. The organizing committee of ACCE have announced the Dr Jackie Rehkopf Best Paper Award winners for the show taking place from 7-9 September 2016.